Prices of seed cotton touched the season’s new high at Rs 3500 on the cotton market on Monday amid persistent demand for quality cotton, dealers said. The official spot rate was unchanged at Rs 6,550, dealers said. 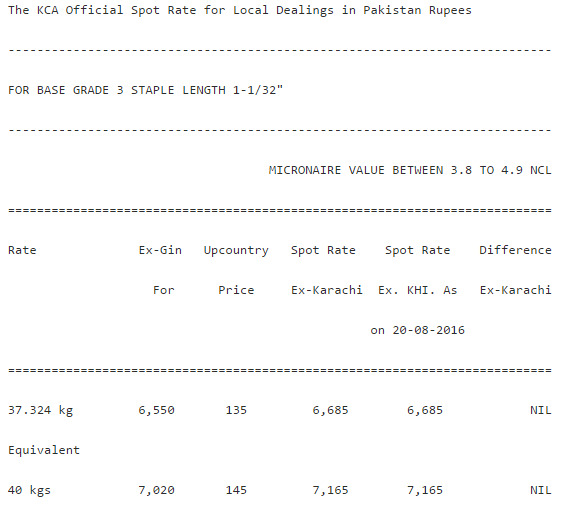 In both Sindh and Punjab, seed cotton prices were higher by Rs 100 to Rs 3300-3500, as per 40 kg, respectively, they said. In ready business, around 20,000 bales of cotton changed hands between Rs 6700 and Rs 6900, they said. According to some brokers, it is expected that prices of fine quality may up due to rising demand against the short supply. Sharing the same views, cotton analyst, Naseem Usman said that rains again started in Sindh and Punjab, so it is most likely that prices may go up in the coming days. He also feared that just after the downpour, moisture content in Phutti may have quality problem and also cause short position as well. Besides, he said that the Cotton Crop Assessment Committee (CCIC) in it’s meeting will decide about the cotton production figure for the current season. He also said that Phutti arrivals continue to gradually improve and the quality of cotton has also improved but after the fresh rains, may not maintain arrivals pace and quality as well. The following deals were reported: 2000 bales from Sanghar at Rs 6700-6750, 1000 bales from Shahpur Chakar at Rs 6750, 3000 bales from Shahdadpur at Rs 6750, 2600 bales from Tando Adam at Rs 6750, 2000 bales from Mirpurkhas at Rs 6750, 1200 bales from Hyderabad at Rs 6750, 800 bales from Kotri at Rs 6750, 800 bales from Maqsoodo at Rs 6750, 800 bales from Khadro at Rs 6750, 1000 bales from Hala at Rs 6750, 800 bales from Moro at Rs 6750, 400 bales from Kazi Ahmed at Rs 6750, 400 bales from Burewala at Rs 6775-6900, 400 bales from Khanewal at Rs 6825-6850, 400 bales from Rahim Yar Khan at Rs 6850 and 600 bales from Chichawatni at Rs 6850-6900, dealers said.